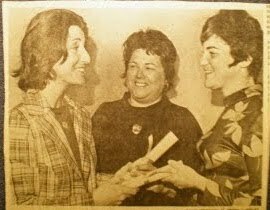 November 14, 1973: Philadelphia NOW President Jan Welch presenting Barefoot and Pregnant Award for Sexism To the Union League and honoring Philadelphia women, Judge Merna Marshall and Attorney Lynn Abraham, for their courage in standing up to sexism in public life. Most of the published material documenting the history of second wave feminism focuses on a few major urban centers—e.g., New York City, Boston, Chicago, and Los Angeles. The national narratives tend to rely on the same sources and recycle the same anecdotes. Until regional and local histories are incorporated into the national narrative, a comprehensive history of the feminist movement cannot be written. Sadly, much archival material about second wave feminism is gathering dust in the closets and basements of feminists now in their late sixties, seventies and eighties. Did it warm your heart to see the front page of today's Inquirer - "A Barrier Falls at the Union League". Joan Carter was elected president--the first in Union League history. Couldn't help recall the good 'ol days of the 70's when Philadelphia NOW gave the "Barefoot & Pregnant" award on Sadie Hawkins day to the Union League amid much publicity. How this came about: Judge Lisa Richette came running after me on Sansom St near 17th. She had just left the Union League after giving a speech to a large group of National and International business men; she was the keynoter. When she went up the front stairs to enter, she was told that women were not allowed to enter by the front door; she would have to go around back and through the kitchen to enter. She was outraged ; she said she gave the attendees holy hell about this indignity and many of their long foreheads (bald) turned beet red. She said Phila NOW had to do something to stop this humiliating practice. I brought it back to the chapter and we voted to present our (then) annual "Barefoot &Pregnant" award on Sady Hawkins day to the Union League. About 4 or 5 of us went to the front of the Union League around 4 in the morning and placed a huge pink bow on their front door along with our proclamation. Next morning, a color photo was on the front page of the Inquirer. It caused quite a stir and several male colleagues who were members told me it started a huge and heated debate among the membership. One debate after another caused them to reconsider and some of the younger members were able to change the policy... I believe this was a big accomplishment for Phila NOW... We did a lot of good and remarkable things in those days, and we should enjoy our victories. In many cases, no one knows about them but us, but that is enough. Well, I don’t think it is enough. We need to remember and honor the women who changed our world. There were two accounts of the election of Joan Carter in the Philadelphia Inquirer--one by Mike Armstrong and the other by Melissa Dribben Neither mentioned the pressure from local feminists. Only in Jenice Armstrong’s article in the Philadelphia Daily News was there any sense that the Union League’s change of heart was a response to pressure from feminists. Armstrong credits "a slew of negative newspaper editorials, political pressure and arm-twisting from the National Organization of Women." But acknowledging NOW isn’t enough. We should acknowledge the individual women who first applied the pressure that a decade later would result in barriers falling--women like Lisa Richette and Lillian Ciarrochi and other feminists who were part of a small minority challenging gender injustice. Would the Union League have changed without the pressure from Lisa Richette and Philadelphia NOW? No doubt eventually. Fundamental social change doesn’t happen overnight. First, you need the visionaries like Richette and Ciarrochi to plant the seed. It is hard to believe that integrating the Union League was a really radical idea in 1973. These women raised the issue with the public and started a process of self-examination within the Union League. NOW will also honor three Philadelphia women for their courage in standing up to male chauvinism in public life; for their challenges to female role stereotyping and for providing women with a positive career image. The women are Judges Lisa Richette and Merna Marshall and Lynn Abraham, Esquire. At any rate, so I would bring the information back to the [Phila NOW] chapter, never giving his name...The Union League finally took a vote because they were fighting all of the time about this. The publicity kept up, we kept it up, we picketed them, all kinds of things. They voted to allow women members by about ten votes, because the younger men saw the handwriting on the wall, saw that it was wrong and they wanted to change it.. It was so exciting to be able to break down these barriers but you had to hit the streets. You couldn’t just be lady-like and say well we think women should whatever, you had to embarrass them to do whatever you could to raise their consciousness to do the right thing. Despite living in Philly in 1973, I don’t remember anything about this event. At that time I was involved with a little rag-tag band of leftists who wanted to overthrow capitalism rather than fight to ensure women and minorities a seat at the table. Fortunately, there were feminists who had a better handle on what was possible than I had and who were determined to change the distribution of power. Lillian and others worked tirelessly to expand opportunities for women. Sadly only one newspaper account acknowledged the feminists who first pushed to end gender discrimination at the Union League—-and that account did not mention their names. I intend to do what I can to make sure we don’t forget the individual women who devoted their lives to the struggle for gender justice. Thank you for your information about these courageous women. The whole discussion is actually related to Feminists must remember our founding members and that includes the not-so-famous ones but i really like the background of this website its really amazing and very attractive. I actually try to place the order of dissertation but due to its sound good approach of this site happy to come here.